One of our primary goals at Ilan Dei Studio is to convey brand identity through unconventional and innovative artwork. This goal constantly drives us to think of branding as a story rather than simply a logo. 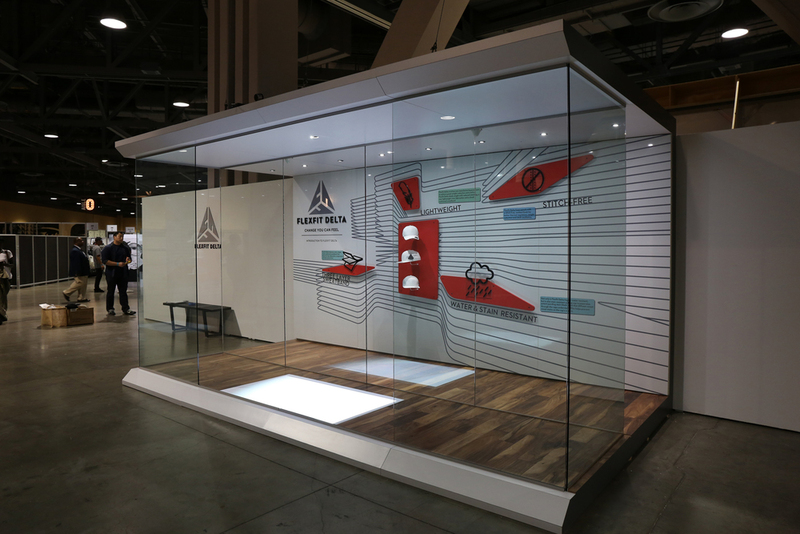 A few months ago, the team at Flexfit gave us the perfect opportunity to push our graphic skills by asking us to design a traveling trade show boot introducing their sleek new line of hats, Flexfit Delta. Our challenge was to communicate four of the hats features: water and stain resistance, a three layer sweatband, lightweight materials, and seamless construction, through simple iconography rather than text. We asked ourselves: How can our design maximize the message while minimizing visual disturbance? And: How can we convey a great deal of information through simple form language? Of course, our primary goal was to create beautiful artwork to promote the product. We decided to think of the project as a 3-dimensional billboard that would use not only simple icons but also layers of color and texture. These layers included a background wall with lines of movement, small printed plates with text that enhance the message of the iconography, thick colored panels behind the icons, the acrylic icons themselves, and finally the physical hats seemingly floating at the center of the "billboard." In order to create the graphic background, we built a digital 3-d model of an undulating wall that could hold each one of the icons. A series of lines were cast upon the wall and a flattened pattern was created lending a sense of movement to the printed Omega Board panels. We designed the panels with a series of attachment points so the billboard could be assembled and disassembled as it traveled from city to city. A series of foam surfaces were designed to fit within each undulating space. We gave them a vibrant red hue to pop off the wall panels. We then designed the icons using simple heavy black lines. We layered the icons using thick clear acrylic behind thinner black acrylic (all cut in house) to create the illusion that the icons were floating off the colored panels. The final touch was to add the Delta hats to the center of the billboard. We placed three at varying angles so the customer could relate the information back to the product itself. We couldn't be more thrilled to see our Flexfit Delta Billboard with legs, traveling from city to city, trade show to trade show to promote this innovative product.